Government land agent Donald McLean is one of the men standing in the left foreground in this 1863 drawing. 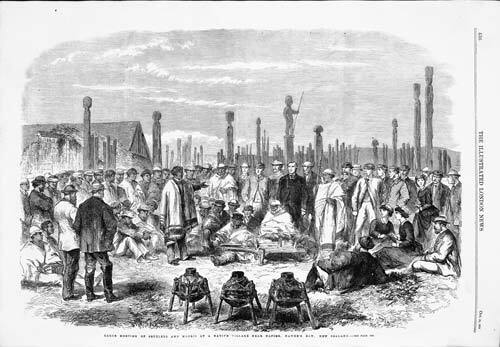 It shows a meeting of settlers and Māori at a pā near Napier, Hawke's Bay, where McLean was then living. A fluent speaker of Māori, McLean had been a sub-protector of aborigines in the early 1840s. He later became the government's chief land purchase commissioner and native secretary. From 1866 he represented Napier in Parliament, eventually serving as native minister.